The American Diabetes Association is the only non-profit organization supporting all 30 million Americans living with diabetes. The Association funds research to prevent, cure and manage diabetes; delivers services to hundreds of communities; provides objective and credible information; and gives voice to those denied their rights because of diabetes. Founded in 1940, our mission is to prevent and cure diabetes and to improve the lives of all people affected by diabetes. 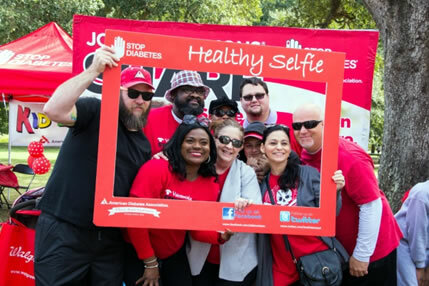 The American Diabetes Association provides information and resources to help every child, every adult and every family adjust to life with diabetes. Are you looking for food and fitness information? Are you worried about medical care and costs, or how to manage diabetes at school? Are you looking for a local Camp or other programs that support people with diabetes locally? ADA is here to help! For Parents & Kids: We have a number of incredible resources to help you and your family live with diabetes, such as the Everyday Wisdom Kit that is provided at no cost to you and helps families plan for everyday moments and events such as birthday parties, playing sports and getting behind the wheel. Planning for a Healthy Life: Use our healthful tips on check-ups and vaccines, eating healthfully, and other issues that impact your future by visiting the Recently Diagnosed section of our website for additional information and tips for living with diabetes. Food: Healthful food is key to managing diabetes and people with diabetes have the same nutritional needs as everyone else. Only you can decide what to eat and using a meal plan as a guide can make it easier. Discover more about recipes, what you can eat, and how MyFoodAdvisor can help. When you walk, you help Stop Diabetes: Walking is a great way to get fit. It improves circulation and mobility, promotes weight loss and even helps reduce stress. And there's no better time to begin a walking routine than right now. If you're not used to being active, start with 10 minutes each day and build as your energy increases. When you begin, find a comfortable pace and try to add about three to five minutes to your walking time each week. A good goal is to shoot for is to walk 30 to 45 minutes, five days a week. Refer to these simple tips to get moving, or contact your local walk manager at 1-888-DIABETES to see if there is a Training Program for your local Step Out: Walk to Stop Diabetes. Online Community: Connect with other people living with diabetes through the online ADA Community.